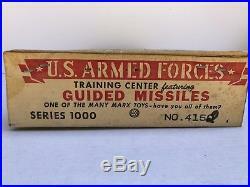 1958 Marx Armed Forces Training Center Play set with MIB contents: unassembled, unlettered T1-14 large Army Headquarters Cabin w stovepipe chimney, HP SABRE Jet, Nike launcher w compass- 3 red, white & blue rockets;7- piece helicopter, six piece fencing molded in rare flat silver. 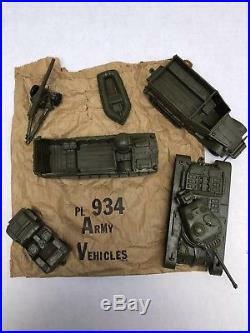 Includes the special 4 Armed Forces Insignia Badges : ARMY. 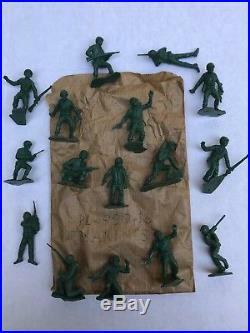 Navy, Air-force, Marines molded in gold soft plastic. 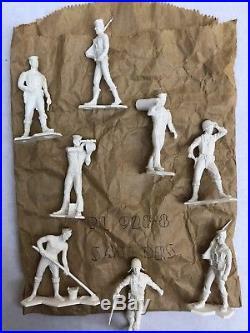 1958 is when the Marx 54mm soldiers and Marines, the eight 54mm Sailors (rarest of all 54mm Marx Combat/ Armed Forces Figures) and New armored vehicle set made their debut. 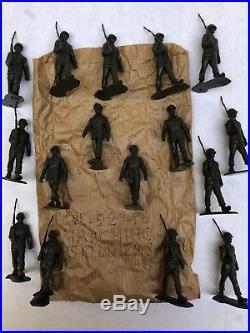 Early vibrant colors; fresh out of the original molds w/o flashing, crisp details, no shortened bayonets, etc. 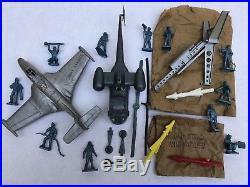 This is an original, complete play set with unplayed with contents. 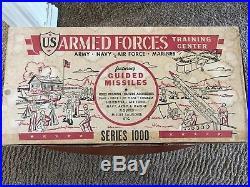 Box is in excellent condition w water marks sprinkles? 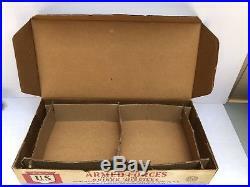 Some tape residue along front edge: box is solid w no repairs. 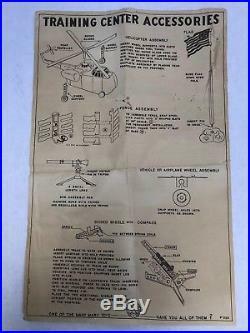 Original dividers, 2-page instructions, labeled bags some have tears & holes -ie:vehicle bag. 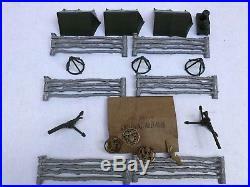 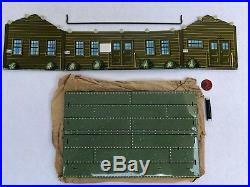 The item "1958 Marx Armed Forces Training Center Play Set. 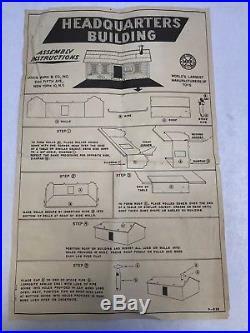 54mm Sailors" is in sale since Sunday, September 23, 2018.